LET-LOK of series 2200 are designed for prevent loosening through vibration to provide locking and sealing of threaded assemblies. No other added locking machine equipment or process to applied, only a few drops of LET-LOK 220 can solve all the problems. Cures without cracking or shrinking. Have high、medium、low strength products for customer to choose. Clean all threads(bolt and nut)with cleaning solvent. 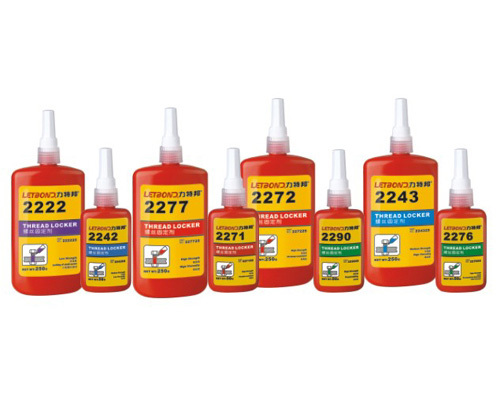 Select the proper strength LETBOND® threadlocker product, apply several drops of Threadlocker on to bolt at targeted tightened nut engagement area. Purple, low strength, easy removable, corrosion resistance. Typical application: locking and sealing of small screw. Blue, medium strength, disassembly with hand tools. Blue, medium strength, oil resistance. General purpose. Red, high strength, high viscosity, excellent chemical resistance and shockproof. Red , high strength , low viscosity. Green, high strength, specially used for inactivity materials. Red, high strength, high viscosity, permanent locking, disassemble at heated. Green, low to medium strength theadlocker. Penetrate threads by capillary action . Secure set screws and other assemblies after setting .